Protein is so much more than a food, a fad, or a supplement. It is in YOU. And it does incredible things! Your body turns over about 200g of its own protein a day! Many different elements of your body are composed of protein including DNA, enzymes, immune system antibodies, and even hormones. Over 40% of body protein is found in skeletal muscle, 25% in organs and the remaining 35% found in the skin and blood. Chemically, proteins are compounds that are made up of the elements nitrogen, oxygen, carbon and hydrogen. Biologically, proteins have many sizes and functions. They are known as amino acids in their smallest forms. DIGESTION & WHERE IT IS USED! Breakdown of protein begins in the acidic conditions naturally occurring in the stomach. Once the contents of the stomach empty into the small intestine, enzymes within the small intestine digest the protein further into smaller components. These components, amino acids, are then absorbed through the intestinal walls into the blood stream and directed to the liver. The liver monitors protein intake and adjusts the rate of its metabolism according to the needs of your body. Some of these needs include the synthesis of DNA components, plasma proteins for the transport of vital vitamins and minerals, and nitrogen-containing non protein compounds like carnitine (well known for its function of making fat available for metabolism). Depending on your body’s needs, the liver will release amino acids into circulation for use by other tissues. If amino acids are not required by the body for use in protein synthesis or nitrogen-containing compounds, they are deaminated. In other words, the nitrogen in the amino acid is removed. Within the liver, it is converted to the compound urea and then goes to the kidneys to be removed via urination. The remaining parts of the original amino acid can then be used for energy, blood glucose, ketone bodies, cholesterol, or fatty acid production. The Branched Chain Amino Acids (isoleucine, leucine and valine) are mostly taken up by the muscle. Additionally, amino acids such as aspartate, asparagine, glutamate (a derivative of the amino acid glutamine) are also processed primarily by the skeletal muscle, especially for protein synthesis. A few amino acids can be used by skeletal muscle for energy. In particular, leucine can be broken down to generate more ATP (energy) than glucose. The use of leucine for energy generally occurs in body states such as fasting or very low calorie intake conditions. Moreover, it was found that under low calorie and low carbohydrate conditions, the muscles and liver work together to maintain muscle protein content as well as blood sugar levels (which is used by the muscle for energy) through a cycle known as the alanine-glucose cycle. The estimated average requirement for protein intake is based on the reduction of chronic disease and intake of essential nutrients to prevent illness due to deficiency. In fact, the USDA emphasizes in its 2010 Dietary Guidelines that the protein, carbohydrate, fat and total caloric intake is geared toward healthy weight loss and weight maintenance. No tolerable upper intake level for protein, or any of the amino acids, has been established due to lack of consistent scientific evidence of toxicity or factors that would require a max level to be set. 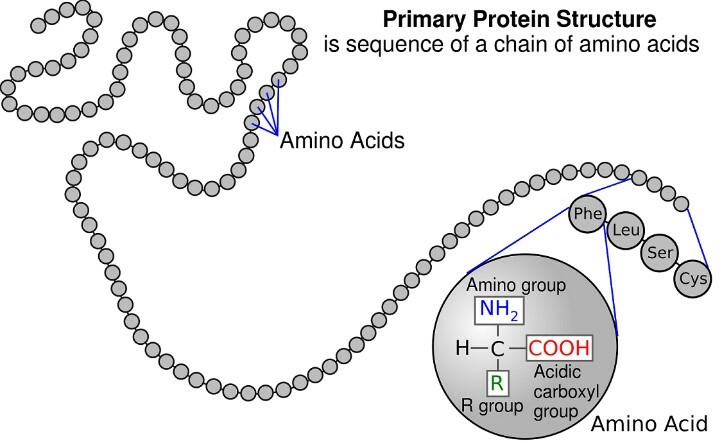 In summary, the way protein and its amino acids are digested is a complex process involving a balance between many organs. The way it is used in your body depends on your daily activity, dietary intake as well as overall health status. It can be used for the synthesis of muscle, enzymes, DNA or hormones. It may be broken down for energy production or can be stored as fat. This all depends on how you balance your lifestyle with respect to physical activity and all nutrient intake. Just adding more protein to the diet isn’t necessarily the answer! Stay tuned for more information on how protein plays a role with respect to overall diet and the differences between its utilization for an endurance athlete, a bodybuilder, weight loss and healthy weight maintenance. Gropper, Sareen Annora Stepnick., Jack L. Smith, and James L. Groff. “6 Protein.” Advanced Nutrition and Human Metabolism. 5th ed. Australia: Wadsworth/Cengage Learning, 2009. 179-245. Print. Smith, Colleen M., Allan D. Marks, M. A. Lieberman, Dawn B. Marks, and Dawn B. Marks. Marks’ Basic Medical Biochemistry: A Clinical Approach. Philadelphia: Lippincott Williams & Wilkins, 2005. Print. “Dietary Guidelines for Americans.” Dietary Guidelines for Americans. N.p., n.d. Web. 07 July 2015. <http://www.cnpp.usda.gov/DietaryGuidelines&gt;.